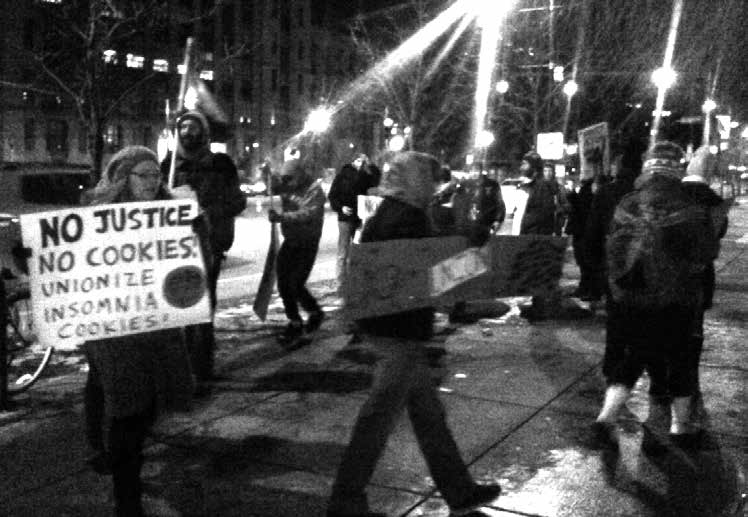 An article by Jake Carman about a settlement between IWW strikers and a Boston area retail cookie shop. On March 3, Insomnia Cookies and four striking workers agreed to a settlement of National Labor Relations Board (NLRB) charges, officially ending a sixmonth strike. The four workers, Chris Helali, Jonathan Peña, Niko Stapczynski, and Luke Robinson, struck on Aug. 18, 2013, demanding changes at work, including higher pay, benefits, and unionization, and were fired immediately. According to the terms of the settlement, they will all receive back pay totaling close to $4,000, and have their terminations rescinded from their records. Insomnia Cookies will post a notice in their Harvard Square store promising not to fire or otherwise retaliate against workers for union activity, including going on strike. Additionally, Insomnia revised a confidentiality agreement which improperly restricted workers’ rights to discuss their conditions of employment with one another and third parties (including union organizers and the media). When the four workers, comprising the entire night shift at the Harvard Square Insomnia Cookies, voted unanimously to close the store after midnight on Aug. 18, 2013, they served cookies to the customers already in line, and then locked the doors. The workers put protest signs in the windows, wrote up a strike agreement and informed their boss they were striking for a raise, health care and other benefits, and a union. The following morning they returned to set up a picket line, and reached out to the IWW, which sent union organizers to help. Within the first few days, all four were fired, and all four signed union cards. For the next six months, strikers, IWW members, allies, and student organizations at both Harvard and Boston University held pickets, marches, rallies, forums, phone blitzes, and a boycott, while workers continued organizing at both the Cambridge and Boston locations. The union also pursued legal charges through the NLRB. The settlement reached on March 3 came two days before a scheduled NLRB hearing on the charges. Other outstanding issues remain unresolved between workers and the company. Wages, benefits, break time, scheduling, safety, “independent contractor” status of delivery workers, the November 2013 firing of IWW member and Insomnia baker Tommy Mendez, and police violence against a picket line and resultant charges against IWW member Jason Freedman, top the list of grievances. But for now, union members are celebrating. “Being a part of the IWW means something to me,” said Peña. “I will never forget the four amigos, Niko, Chris, Luke, and I. We actually made a difference. Being a Wobbly can change your life! I just want to really thank everyone for their solidarity and commitment to crumbling down on this burnt Cookie,” Peña added. UPDATE: Six days after the settlement, on Sunday, March 9, Insomnia Cookies suspended bicycle delivery driver and IWW organizer Tasia Edmonds. Edmonds was disciplined for speaking out against workplace injustices, which the boss called “insubordination.” According to Edmonds “I was suspended for my union involvement. I have never been disciplined before. I was not served any paper work detailing why I was suspended. I want to get back to work, and I want back pay for the days I missed.” Two dozen IWW members and allies picketed the Boston Insomnia Cookies location, where Edmonds is employed, on Friday, March 14. Organizers planned another rally for Saturday, March 22, after student allies from the abutting Boston University return from spring break. The IWW demands that the company follow through on its promise to cease targeting union organizers.